Identical twins have superimilar genes! An international group of researchers discover a new phenomenon that occurs in identical twins: a mechanism associated with risks for cancer in adulthood. The work appears in the journal Genome Biology. "The characteristics of an individual depend not only on genes inherited from parents, but also on epigenetics — molecular mechanisms that determine which genes will be turned on or off in different cell types. If we view one's DNA as the computer hardware, epigenetics is the software that determines what the computer can do." Robert A. Waterland PhD, Associate Professor, Pediatrics and Nutrition, USDA/ARS Children's Nutrition Research Center, Texas Children's Hospital; Molecular and Human Genetics, Baylor College of Medicine, Houston, Texas, and senior author. Epigenetics works by adding or removing chemical tags to genes, thereby marking how those genes are to be used in different cell types. The methyl chemical group is well known to play an important role in human development as well as in cancer. In a large study of identical and fraternal twin pairs, genes called metastable epialleles came under review. Previous research has indicated methyl tags are randomly added to metastable epialleles during early embryo development and maintained throughout life. Waterland: "We expected that the patterns of methyl tags added to metastable epialleles would be equally random in identical and fraternal twins. Instead, we found the methylation patterns matched almost perfectly in identical twins, a degree of similarity that can't be explained by the twins sharing the same DNA. We call this phenomenon 'epigenetic supersimilarity.'" Identical twins are formed when the very early embryo - a simple ball of cells - splits into two parts, each continues to develop into a separate human being. The authors then tested a simple model to explain epigenetic supersimilarity. "If epigenetic markers are established before the embryo splits into two, then the markers will be the same in both twins. On the other hand, epigenetic markers set [in place] after the embryo splits create greater epigenetic differences between the twins," explains Waterland. Epigenetic supersimilarity seems to occur in a relatively small group of genes, but many of these are associated with cancer. To test whether these epigenetic markers might affect the risk of cancer, scientists in Houston teamed up with cancer epidemiologists at the Cancer Council Collaborative Cohort Study in Melbourne, Australia. This large study was begun in the '90s to assess cancer risk factors. "By analyzing peripheral blood DNA samples from healthy adults, we have been able to show methylation at supersimilar genes is associated with risk of developing several types of cancer, including lung, prostate and colorectal." Roger Milne PhD, Associate Professor, Head of Cancer Epidemiology, Cancer Council Victoria, and an author on the study. At the epigenetic level, the study shows identical twins are more similar to each other than ever previously recognized. "Our findings should prompt a re-evaluation of previous genetic studies on twins," Waterland adds. "For decades, researchers have studied genetically identical twins to estimate what proportion of disease risk is determined by one's genes. To the extent epigenetic supersimilarity affects risk of disease, as our results indicate, genetic risk estimates based on twin studies have been inflated." Monozygotic twins have long been studied to estimate heritability and explore epigenetic influences on phenotypic variation. The phenotypic and epigenetic similarities of monozygotic twins have been assumed to be largely due to their genetic identity. Here, by analyzing data from a genome-scale study of DNA methylation in monozygotic and dizygotic twins, we identified genomic regions at which the epigenetic similarity of monozygotic twins is substantially greater than can be explained by their genetic identity. This “epigenetic supersimilarity” apparently results from locus-specific establishment of epigenotype prior to embryo cleavage during twinning. Epigenetically supersimilar loci exhibit systemic interindividual epigenetic variation and plasticity to periconceptional environment and are enriched in sub-telomeric regions. In case-control studies nested in a prospective cohort, blood DNA methylation at these loci years before diagnosis is associated with risk of developing several types of cancer. Funding: TEV was supported by training grant award RP 140113 from the Cancer Prevention & Research Institute of Texas (CPRIT). CC was partially supported by CPRIT grant RP170005. The ENID Trial was jointly funded by the UK Medical Research Council (MRC) and the Department for International Development (DFID) under the MRC/DFID Concordat agreement (MRC Programme MC-A760-5QX00). MNR, YYG, SEM, and ZH were supported by the Bill and Melinda Gates Foundation Grand Challenge “Achieving Healthy Growth” scheme (grant OPP1 066947). ZH and AG are supported by grants from the Institut National du Cancer (INCa, France) and Association pour la Recherche sur le Cancer (ARC, France). Gustave Roussy, Villejuif, Cohort recruitment was funded by VicHealth and Cancer Council Victoria. This work was supported by the Australian National Health and Medical Research Council (NHMRC) [grants 1088405and 1074383]. MCCS cohort recruitment was funded by VicHealth and Cancer Council Victoria. The MCCS was further supported by Australian NHMRC grants 209057 and 396414 and by infrastructure provided by Cancer Council Victoria. The nested case -control methylation studies were supported by the NHMRC [grants 1011618, 1026892, 1027505,1050198, 1043616]. MCS is a NHMRC Senior Research Fellow. JLH is a NHMRC Senior Principal Research Fellow. RAW was supported by grants from the USDA (CRIS 3092-5-001-059), CPRIT (RP170295), and UK-MRC (MR/M01424X/1). None of the funding bodies played a role in study design or data collection, analysis, or interpretation. 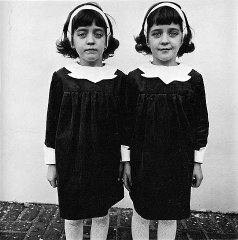 Diane Arbus photograph, Identical Twins, Roselle, New Jersey, 1967. Wikipedia.